Derby boss Frank Lampard has been fined £2,000 after accepting a Football Association improper conduct charge following Saturday's game at Rotherham. 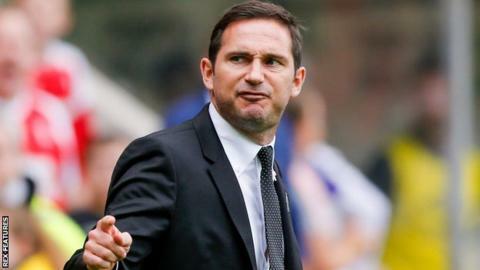 Lampard was sent to the stands after arguing with officials in the 77th minute of the Rams' 1-0 defeat. The 40-year-old was protesting against a handball decision, having earlier seen midfielder Tom Lawrence sent off and a penalty awarded against his side. "It's done, I'll accept the fine and move on," he told BBC Radio Derby. "Probably some of my frustration was that we didn't play as well as we should have done on the day. "Also I think communication's an issue. If you are going to give referees [the ability to issue managers] a yellow card and a red card, there needs to be communication in between that. "I was trying to speak to the ref and the linesman and they completely ignored me the whole game. That communication can stop yellow cards and red cards. "I take responsibility for leaving my area, that's why I've accepted the fine. I think referees and linesmen can take responsibility for being big enough to communicate properly and answer questions."